Flexible display technology has become more important in the creation of smartphones over the last few years, with some major players in the industry already revealing their takes on the concept with foldable smartphones. 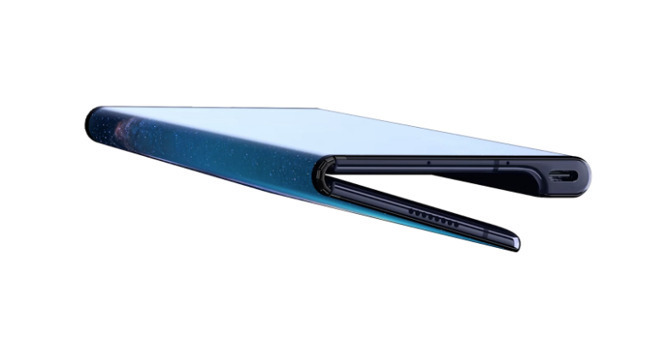 The Samsung Galaxy Fold, Huawei Mate X, and the Royole Flexpai all offer a large screen that can be cut down to almost half the size, all by folding the device in half down the middle of the screen. While the concept is clear, the early state of the technology and the first few attempts at producing a smartphone that changes into a tablet suggest that there is more in terms of refinement that needs to be done before it can be a viable product for most users. The display, the most important part of the new form factor, is also the most vulnerable and in need of improvement. In a patent application from Apple published by the U.S. Patent and Trademark Office on Thursday titled "Electronic Devices with Flexible Displays," the iPhone maker suggests temperature could be an issue for the displays. While at or in the region of typical temperatures hospitable to humans, folding systems may work fine, but adhesives and other elements used in a device's production may become more resistant to flexing at cold temperatures, which could cause unwanted wear or damage to the display if attempted in such conditions. To mitigate the cold temperature, Apple simply suggests there should be some way to warm up the area of the display panel where the bend takes place. As part of Apple's solution, an onboard temperature sensor is used to determine how warm the device is, and whether or not there is any danger to allowing the screen to be flexed by the user. The warming process itself can be performed by a heating element located near to the section that bends the most, with heat conductors transferring the warmth to where it is required. A heating element may not be practical to add to such a device, which has led to Apple suggesting an alternative, namely using the heat generated by illuminating the screen. To do this, a screensaver could be used that concentrates most on the bent section, such as by making it brighter and lit up more than the rest of the screen. As the heating process could take time to complete, Apple notes there is a danger of the display being flexed before it is safe to do so, something it has also considered. 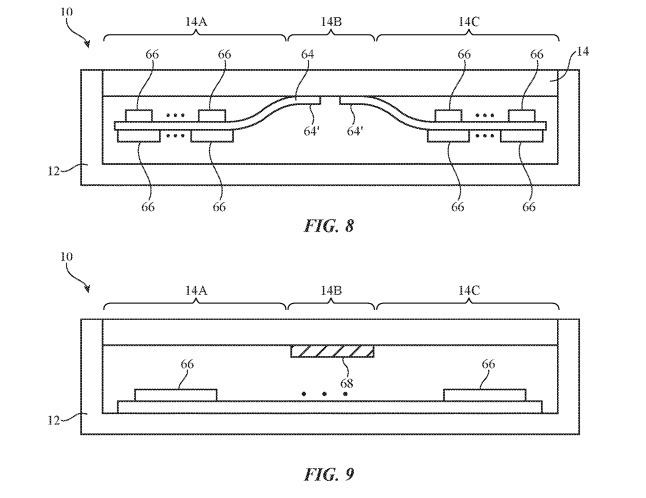 Aside from warning the user on an attempt to bend, Apple believes the use of a latching mechanism to keep the device closed while folded may be worth investigating, both as a mechanical latch and by the folded device being held shut by magnets. When the temperature of the area is relatively safe, the latching system can be disengaged and the user will be free to open the device once again. The patent application does not seem to answer the question of how to prevent the user from folding up an unfolded device, but it could be feasible some form of locking mechanism could be used when the smartphone is flat. Apple files numerous patent applications on a weekly basis, but while the USPTO publishes many applications and granted patents from the company, they should serve only as an indication of Apple's areas of interest. There is no guarantee any concepts described in the filings will make an appearance in a future Apple product or service. Apple certainly has been linked to the development of a foldable smartphone, with rumors claiming it is working with LG on displays that could potentially end up in a flexible future iPhone. Analyst speculation suggests an iPhone with a foldable display could launch as soon as 2020, but given Apple's standards, it would require the technology to be far more refined before being deployed at an iPhone's scale. The company also has numerous other patents and applications that would be handy for a flexible smartphone, including those directly concerning flexible displays as well as wrap-around screens and hinged devices. 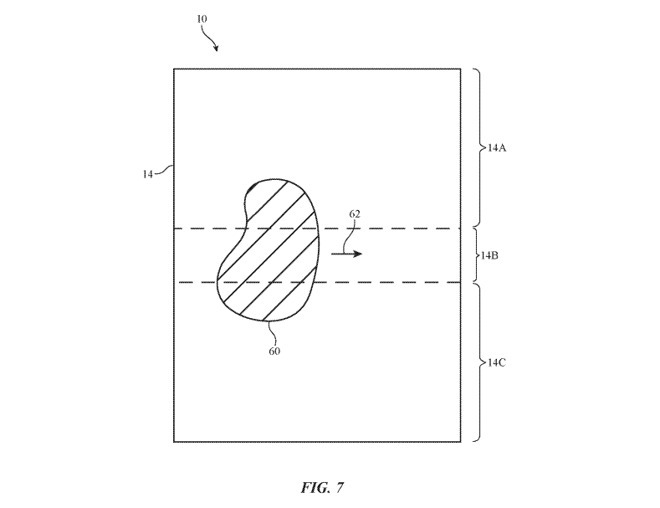 Apple has also explored ideas of using stretchy substrates to attach components in a flexible device together, as well as how to enable force gesture controls on the hardware. While I'll sure Apple could design a great foldable phone, this far I'm not sold on the bed and certainly not cost. In general, what is the purpose or what problem is addressed by foldable screen? Let's be specific and stop mumbling about "screen estate" as may not be practical. Who ever asked for a foldable smartphone? What an utterly ridiculous gimmick. I'm sure Apple is keeping up with it from an R&D standpoint to make sure they don't get left behind on the off chance it became a major hit...but it's not, and it won't. The very idea of bending the display is inseparable in my mind from permanent damage. So that alone is a hard road to climb. None of the form factors that are even possible with this idea are appealing as a usable canvas, so the real estate argument is out. This is right up there with the "3D" display gimmick from a few years ago, and the curved displays that no one wants. Samsung is still pretending anyone cares about curved edges on screens, because they misunderstood their industrial espionage prior to the iPhone 6 release. This how the tech blog universe works. Whatever is new is touted as the next big thing. Sometimes that turns out to be true but most of the time the next big thing fades into oblivion. Then the next, next big thing appears and the cycle repeats. Right now every talking head is falling all over themselves to declare foldable phones the second coming of the Messiah. Until they are actually in people’s hands we won’t know if they address a “problem” or not. And of course those same talking heads are bleating about Apple’s impending doom if they don’t follow the herd. Just look at the ‘reverse wireless charging’ feature - you take out the headphone jack and force (or at least push really hard) people to use Bluetooth headphones that loose their charge and then come up with the most inefficient way possible to charge them, taking power from your phone that can’t last all day anyway and loosing energ;y in the process and doing it in a way that means you can’t use your phone in the process. But yeah, this is a really cool, awesome feature! As someone who’s still thawing out from the polar vortex (slowly, given the fact it was still -3º when I got up this morning.) I’ll add a brittle OLED screen to the other reasons I’m not dying to get a foldable phone. Seems screen folding inwards not outwards makes sense for so many reasons. Foldables are just another dumb fad these companies have convinced each other is their next big thing. Its an engineering/design solution to a problem which doesn’t exist. Apple doesn’t mention foldable phones, it’s "Electronic Devices with Flexible Displays”. You’re not sitting out in freezing weather typing on your phone. I live in Colorado, and I’ve had to wait a bit in subzero for a movie, my phone and more importantly hands were in my pockets. Now, if I had smart glasses or watch on, yep those suckers would have been exposed. Sure, the tech could be used for phones but it’s designed for wearables where the risks are very real. I agree about these folding phones. If Apple came out with one, it would be $3K for it. I get that it's a way to have a phone and a tablet all in one. But it's cheaper to just buy a phone and a Tablet. You currently can't have a glass screen though Corning is supposedly working on bendable glass. But for now it's Plastic Screens. Plastic scratches much easier than glass and would have more issues with the cold and bending. People are all ready complaining about prices and these Folding phones are taking it to a new level of $2K to $3K so far. As for 3D, I just got my Brothers 2015 70" Sharp 3D TV. He replaced it with a 85" Sony Bravia 4K TV. He never used the 3D of it. But that's one of the first things I did with it. I like it. I think it makes much more sense then 4K TV's!!! It's a 70" 1080p TV and it looks great! It replaced my 50" Panasonic Plasma. 70" is about the right size for my room and sitting distance. With 4K you really need to go much bigger, otherwise you're going going to see that extra detail of 4K. Personally after looking at his 85" 4K to my 70" 1080p, I'm very happy with this 70" I also didn't have to replace any of my other hardware like Surround sound Receiver or a new AppleTV supporting 4K. I really like the 3D of it. Even my 70 year old Dad who watched with me, thought it was cool. So I'll be getting some other 3D movies. It's pretty cool. Wearing the glasses didn't bother us. I think it's much more useful than 4K. At least my brother went 85" with his 4K. It is HUGE. He doesn't sit that far from it, and it's not a huge room at all. BUT it's really the proper size TV for 4K and his distance. People got to small of a HDTV for the distance they were sitting. Oh it's already to big, or the wife doesn't want it bigger. 4K is 4 times the resolution. But to really see it, your TV needs to really be BIG!!! Even bigger than a proper size HDTV. Generally I say for that, it may be more practical to get a Front Projector. 70" for the distance I'm sitting at 1080p is around the correct size. It's strange saying this, but 50" was to small. At my old place, it was perfect as I sat half the distance from it. 3D on a big screen is where it's at. I guess you can still get 3D on Front Projector systems. It does have more of a Impact. 3D on a tiny screen? I think is pointless. So I can't wait to watch some of these highly rated 3D movies like "The Walk". I still don't give a cr*p about 4K. On the topic the Huawei folding phone seems like a disaster waiting to happen. The most delicate part of the phone is in the most vulnerable place. Only Apple would know. They wouldn't have patented this tech without solving a problem first. Others just wanna yell "first!". It feels like durability would be difficult. You can't bend Gorilla Glass. I don't really see this going anywhere. At this point it almost doesn't matter. I mean Apple is already so far behind in innovation its not even funny. no VR headset, no hybrid laptop/tablet, no folding phones, we know there car project is all but dead. Dont get me wrong Apple as a company will be around along time but they're lack of innovation is going to kill them long term. On a serious note, I could see folding screens being useful in an automotive application where the highest quality isn't necessary. If you want to tuck a bigass screen out of the way into a compact space like a dashboard, it might make sense.